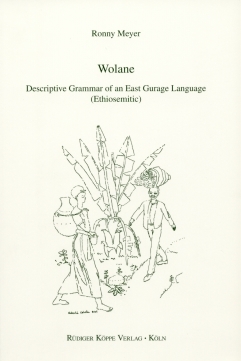 Wolane is an Ethiosemitic language, belonging to the East Gurage group within the Eastern branch of Transversal South-Ethiosemitic. The people live approx. 160 km south of the Ethiopian capital Addis Ababa at the north-eastern edge of the Gurage zone. Besides this Wolane-speaking area, a considerable number of Wolane live in Addis Ababa, earning their livelihood as merchants. The majority of the territory proper lies above 2,300 m and is very suitable for the cultivation of ensete edulis (false banana). In addition the Wolane – who use this ethnonym for themselves and their living area, too – are cattle-breeders. The totalling number of speakers is estimated to be about 70,000, whereas almost all Wolane below the age of 30 are multilingual, mostly using Amharic as a second language at work, in the administration and as the means of instruction in primary education, but also Oromo or other neighbouring languages. The Wolane varieties of these various multilingual groups may differ from the variety discribed in this grammar. The East Gurage languages share a characteristic bundle of features like the reduction of gemination in the verbal domain, a nasal trace of lost initial laryngeals, or the loss of gender distinction in the plural, which indeed occur in Wolane, too, and are dicussed in the three main chapters of the present grammar. After detailed analyses of the phonology, morphology, and syntax of Wolane – which is not a written language till now – the book is completed by language examples, greetings and wishes, an animal tale, and a construction manual for a Wolane house. The present grammar does not follow a single linguistic or theoretical model, but is expressly descriptive, using a structural approach in identifying phonemes and morphemes and a functional approach in describing morpho-syntactic and discourse-pragmatic features. As such it is readily accessible and allows the reader easily to discover and grasp relevant facts about the language.